Forget about housing on Saltdean Lido! 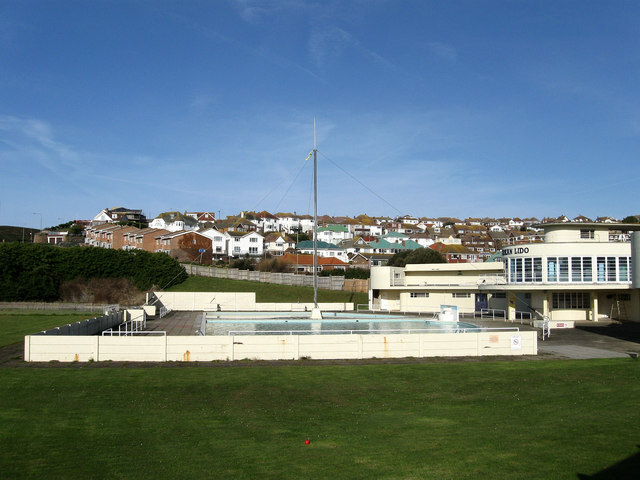 A large development of homes will never be built on the site of Saltdean Lido. That is the strong message from Brighton & Hove council leader Mary Mears. Councillor Mears is responding to concerns among residents at proposals by the leaseholder to build more than 100 flats on the site. No formal planning application has ever been made. Cllr Mears points out that the council is both the freeholder of the site and the local planning authority. In either role, she says, the council would not allow any development which would damage the historic setting. Cllr Mears said: “I want both the leaseholder and residents to forget about the idea of putting significant amounts of housing on this site. It is a complete non-starter. The council will never allow it. “Instead, I am going to call a meeting shortly between the Save Saltdean Lido campaign, the Saltdean Community Association who sublet it, plus experts and lawyers from the council. The aim would be to see how we can protect the Lido as a listed building and make it a permanently viable attraction. The government recently awarded the Lido a ‘star’ listing, upgrading it from its existing Grade 2 listed status. Cllr Mears says she expects invitations to the private meeting with residents’ representatives to be sent out in the next few days. We had a very interesting Council meeting last week, which was dominated by debate over the Bright Start Nursery (I have blogged my statement on this below so won’t say anything more at this stage). But it was also particularly interesting in relation to a couple of housing matters. Firstly, the Green Party and Labour Party united in coalition to support a notice of motion advocating state-control of the private rental market. In my view, this would be pure madness. Rent regulation has been tried before and failed. Economists from all sides of the political spectrum, have criticized rent regulation as economic illiteracy which, despite its good intentions, leads to the creation of less housing, raises prices, and increases urban blight. You can just imagine the stampede of private landlords out of the City if this was introduced – and in Brighton & Hove, which has one of the largest private rented sectors in the country, it would be disastrous for families and individuals who rely upon this type of housing. In their motion, the Greens claimed that rents in the private sector have gone up so much in recent months that it is effectively pricing tenants out of the market. But what they don’t mention is that for most of 2008 and 2009, rental prices for 2 and 3 bedroom properties fell considerably due to the recession. In addition, if you look at the wider trend since 2001, rent rises have been on average lower than inflation over the same period. It is also worth pointing out that for private tenants who claim housing benefit (or Local Housing Allowance as it is now called), it is the independent rent assessor who determines the level of benefit they can receive. The Government’s proposed reforms to housing benefit (much criticised by the Greens and Labour) – to effectively cap how much tenants can receive – are partly designed to bear down on private sector rent levels. This is because there is plenty of evidence to suggest that landlords push up their rents for housing benefit tenants because they know it will be covered by the public purse. I am also slightly puzzled at the Labour Party’s support for the motion. For it was back in 2008 that the then Labour Government commissioned a review into the private rented sector – the ‘Rugg Review’. At no stage did this review consider that capping private sector rents would be advantageous. In fact, they identified the 1988 Housing Act, which lifted rent controls, as one of the main factors in the huge increase in supply of private sector rented properties over recent years. I don’t recall the Labour Group at the time making any representations on rent capping so it is a bit opportunist for them now to be jumping on the bandwagon! A story which appeared in Tuesday’s Argus newspaper claimed that discussions were going on ‘behind the scenes’ between Brighton & Hove City Council and Explore Living over their proposals to redevelop part of the Marina. I would like to make it clear to residents in the area that this is categorically not the case. As far as I am concerned, the decision back in July by the Secretary of State, Eric Pickles, to dismiss Explore Living’s plans is the final word on this matter. They are, of course, entitled to submit a fresh application but as yet, I am not aware that one is forthcoming. Undoubtedly, the Marina is a very important site for future development, for providing housing and employment, and we are looking forward to working with developers who can offer a first class scheme that will work well for the area. Our aim is to make sure that the regeneration of the Marina enhances the site and is of lasting benefit to residents. This will form the basis of any future negotiations about the site. Labour have been issuing leaflets to tenants in Brighton & Hove which make up all sorts of things about Conservative plans for social housing. I wanted to make it absolutely clear that tenancies will be absolutely guaranteed with the Conservatives. I know that tenants across Brighton & Hove have great pride in their homes and the neighbourhood in which they live. Conservatives recognise the importance of social housing and the security it provides. In this election, the Labour Party is issuing leaflets, of which this is just one more example, which are trying to scare people with false claims about our policies and making untrue allegations. Conservatives, both locally and nationally, will not increase rents to market levels, end secure tenancies or ‘slash’ housing benefit. Indeed, it has been the Government’s policy over the last 10 years or so to raise council house rents to bring them in line with the Housing Associations. It was the former Council Leader – Simon Burgess – who tried to force through a stock transfer of your council housing. Following the overwhelming rejection of his plans by tenants in 2007, the Conservative Council has worked extremely hard to secure additional investment in your homes and will always support the wishes of tenants. Labour claim that their proposals to reform the council housing finance system will leave councils better off as they will be allowed to keep all rents and sales income. What they are not telling you is that we will also be saddled with a portion of the £25 billion of historic debt in the system. The rate of house building since Labour has been in office has dropped by almost 24,000 homes a year – to around 147,000 – compared to the levels under the previous Conservative government. In addition, an average of 18,430 social rented homes a year has been built under this Government, compared with 40,538 a year under the last Government. The number of households on local authority waiting lists in England has risen from a million when Labour took over in 1997 to 1.8 million – this equates to more than 4.5 million people. As they did with the lies about benefits for pensioners, Labour is resorting to scaring residents to get votes. These tactics are disgraceful and should have no place in British politics. It is disappointing that Gordon Brown, after 13 years, doesn’t have a positive message about himself or his record on housing. It is now a well established fact amongst statisticians and policy makers that the UK has an ageing population. For example, by 2033 the number of people aged 85 and over is projected to more than double to 3.2 million, and to account for 5 per cent of the total population. Amazingly, in 1983, there were only 600,000 people in this age group. These trends obviously have serious implications for local councils such as ours, who provide lots of services and specialist accommodation for older people. One particular type of housing which I think will become much more common in the coming years is extra care housing. Yesterday, I attended the opening of one such facility – Patching Lodge, just off Eastern Road in Brighton. This is a fantastic state-of-the-art block which we have developed in partnership with Hanover Housing Association and we are very lucky indeed to have secured it. Extra care is such an attractive option to many older people because it allows them to retain their independence in self-contained flats, but also gives them the peace of mind of having support and care on site 24 hours a day. However, if we are to meet the challenges posed by the ageing population I think that our primary aim should be to provide choice for people. Clearly, many will want to remain in their existing homes for as long as possible and we need to help them to do that. But providing high quality extra care accommodation alongside our existing ‘normal’ sheltered housing is going to be vital if we are to meet people’s high expectations into the future.